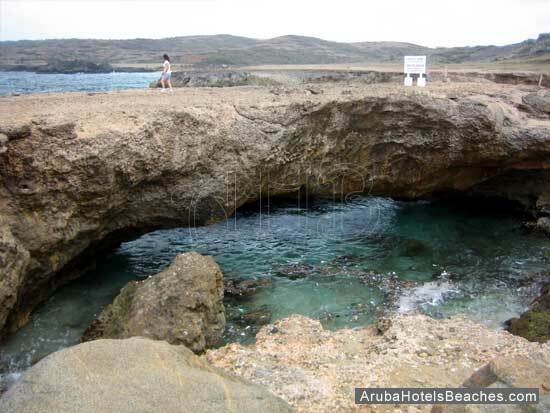 The Natural Baby Bridge is now one of the most famous Aruba attractions located on the northeast shore of Aruba. Most people are surprised to see the "Daughter Bridge" as many people have named it, so close to the original Natural Bridge that had collapsed on September 2, 2005. The original Natural Bridge was quite large with a span of 100 feet and 23 feet above sea level which actually made it the largest of its kind in the Caribbean. The people of Aruba considered it a national treasure and put its photo on most of their brochures to attract tourists. The Natural Baby Bridge is smaller with a span of 25 feet and only 3 feet above sea level. Both formed by coral limestone carved out naturally through years of pounding surf. If you drive around the island you will find other naturally made bridges, but none as popular as the Natural Baby Bridge since it is near the collapsed original Natural Bridge. There is no fee for this Aruba attraction and no set hours to view it. There is a gift shop and a refreshment shop nearby as well as a restroom for a fee. I suggest bringing your own drinks and snacks since the prices are tailored for tourists. Many couples drive along the coastline nearby to find a quiet spot to have a picnic, while they watch the rough surf, take photos, and enjoy the sunset. You can drive there on your own in your rented car but take care since you will be driving on bumpy dirt roads, which actually add to the fun as long as you don’t get a flat tire. If you are looking for other Aruba attractions to check out go to our Sightseeing Page.